I'm not talking about the movie. The cover of the Beatles' Sgt. Pepper's Lonely Hearts Club Band was the most innovative sleeve of its day and is still the most influential cover of all time. 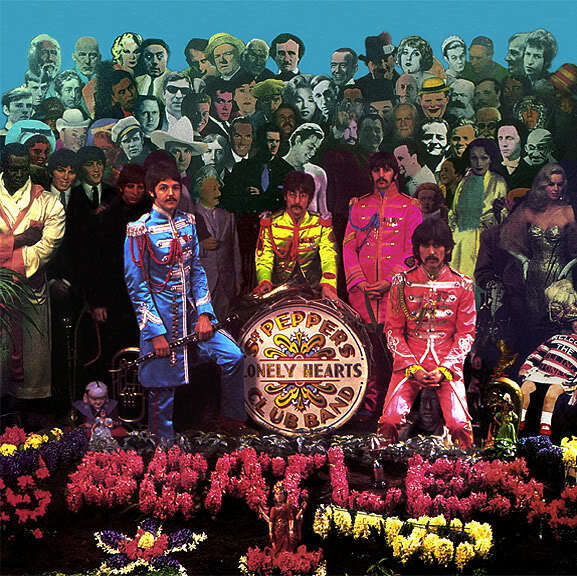 Its use of color and detail was striking enough, but its artistry - the use of famous faces joining the Beatles (er, Sgt. Pepper's band) in the photo - brought originality and imagination to pop record album covers, which before then mostly resembled cereal boxes. You've seen album covers of the early sixties, with their loud copy full of exclamation points and boastful superlatives, the artistes posing stodgily with frozen smiles. After Sgt. Pepper, the rules had changed for both the contents of rock albums and the sleeves they were encased in. So how did the Sgt. Pepper album cover come about? Well, in March 1967, with the LP nearing completion, the Beatles approached fine artist Peter Blake at the suggestion of Blake's art dealer, Robert Fraser, with their idea. Since they were pretending to be another group entirely, giving a concert, they envisioned a cover showing Sgt. Pepper's band having just completed their show in a park. 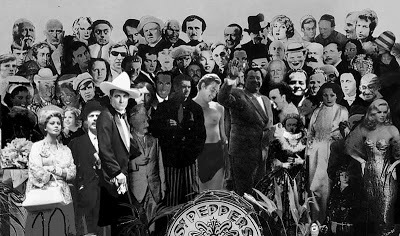 Blake eventually came up with the idea of a collage of people from the concert's audience - made with cutouts and with wax figures from Madame Tussaud's wax museum in London - and asked the Beatles who they'd like to have in it. John Lennon and Paul McCartney came up with a whole list of entertainment celebrities and historical figures, while George Harrison came up with a list of Indian gurus. Ringo Starr didn't bother submitting any names. Blake and Fraser also added names, and Michael Cooper was commissioned to take the photos. It took two weeks for Blake to construct the set, and various props were added. A stone bust of a male figure was added, along with several smaller stone figures and, at John Lennon's suggestion, a portable television set - John correctly predicted that TV would become more influential than it already was. The boy who delivered the flowers asked to contribute, and he added the guitar made out of yellow hyacinths. By March 30, 1967, the day of the photo session, everything was ready. The Beatles donned their fluorescent satin suits and spent three hours posing for not only the front cover but for the back cover and gatefold. Below is an outtake from the Sgt. Pepper photo session. There were many faces in the crowd, some famous, others less so, but the diversity of personalities was astonishing - authors and movie stars congregated with philosophers and sculptors. And gurus. Among the figures in the background are Lenny Bruce, Marlene Dietrich, Laurel and Hardy, Bob Dylan, Tony Curtis, Marilyn Monroe (though not together, and not with Jack Lemmon), nineteenth-century British prime minster Sir Robert Peel, Karl Marx (that was sure to offend the John Birch Society in America), Oscar Wilde, Fred Astaire (who was pleased by the honor), Edgar Allan Poe, and former Beatle Stu Sutcliffe, a painter and the group's original bass player, who tragically died young. There were even even a couple of sports figures - swimmer-turned-actor Johnny Weismuller, soccer player Albert Stubbins, and also former heavyweight boxing champion Sonny Liston, who, ironically, refused to pose for photos with the Beatles in real life when the Fabs visited Miami in 1964 at the time Liston was preparing to fight Cassius Clay, soon to change his name to Muhammad Ali. Ali did pose with the Beatles then, of course. Even more ironically, Liston's wax figure is positioned next to wax figures of the moptop-era Beatles, included by Robert Fraser because he thought it would make sense that the Beatles would want to check out the show of Sgt. Pepper's band. The Beatles were asked by their record company to seek permission from the people still who were still alive to have them featured on the Sgt. Pepper album cover, which their manager Brian Epstein painstakingly handled. Most of them said yes, but Mae West, depicted third from left at the top, initially refused to be included. "What would I be doing in a lonely hearts club?" she said. But the Beatles asked her to reconsider in a personal letter, and West, touched by their effort, changed her mind. Some people, however, were left off the final cover photo. Out of either cynicism or a desire to make some sort of statement with opposing avatars of pure goodness and pure evil, John Lennon had wanted to include Jesus Christ and Adolf Hitler, but good taste prevailed and the idea was rejected. But at least seven other personalities who were featured in the collage were either barely seen or blocked out of view altogether (or removed) in the cover photo that was chosen. Here is the same outtake depicted above, with colored circles around the pictures of people who were not visible on the Sgt. Pepper cover. Leo Gorcey of the Bowery Boys, circled in black, is shown with fellow Bowery Boy Huntz Hall to the right. But while Hall was kept in, Gorcey had to be painted out. He requested a fee for being included, but EMI refused to pay a fee to anyone. And while Mohandas Gandhi, the avatar of non-violent protest, was a no-brainer for inclusion on the cover of the record that would become the soundtrack for the Summer of Love, EMI chairman Sir Joseph Lockwood feared that record buyers in India would be offended by the idea of Gandhi being trivialized by having him standing around with Sonny Liston or actress Diana Dors (the British Marilyn). So Gandhi, circled above in red, was painted out. Two more got in by a hair . . . literally. 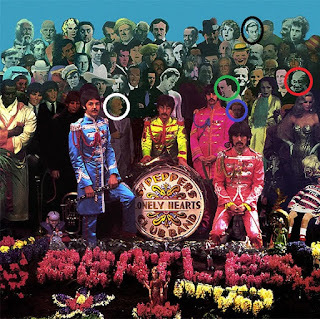 Albert Einstein was also chosen, and the outtake photo clearly shows his head, circled in white, but in the photo chosen for the cover, he's mostly obscured by John Lennon, and so all you see is his famous hair. Note the green arrow in the picture below. I've seen a couple of guides to who's who on the Sgt. Pepper album cover that incorrectly identify the gent between Albert Stubbins and Lewis Carroll as Einstein; in fact, it is Indian guru Lahiri Mahasaya. Bette Davis was also chosen, and a cutout of her as Queen Elizabeth I was added to the collage (as indicated by the blue circle in the outtake photo above), but except for a sliver of her hair (or her crown - hard to tell), she was obscured by George Harrison in the chosen picture, as indicated by the black arrow in the picture below. 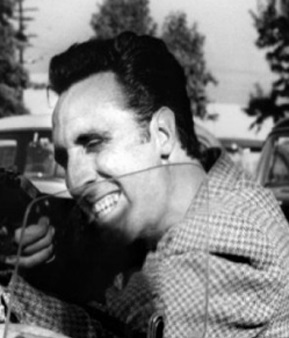 But that was still better than not getting in at all, a fate that befell the image of American actor Timothy Carey. He's the guy circled in green in the outtake photo above. Carey was known for playing violent characters in movies, and the cutout of him for the Sgt. Pepper collage was from his role as Nikki Arane in Stanley Kubrick's 1956 movie The Killing (as shown below). But George's hat completely obscured him in the chosen cover photo. Sophia Loren and Marcello Mastroianni were added, but, as seen below, they ended up behind the wax figures of the Beatles and Sonny Liston, as did a duplicate image of Shirley Temple (who's also shown standing next to Dietrich). And the doll wearing the Rolling Stones shirt is a Shirley Temple doll. The Sgt. Pepper album also came with cardboard cutout inserts - a stand-up picture of the Beatles, various badges and chevrons, a clip-on mustache (a parody of Beatle wigs, the group now offering the chance for the fans to copy their facial hair), and a portrait of Sergeant Pepper himself that was based on the stone bust on the front cover. Deleted from subsequent LP reprints, the inserts returned when the original Sgt. Pepper CD was issued in 1987 when the CD, like other CDs at the time, was issued in an oversized cardboard longbox to prevent record-store shoplifting. The cutouts were printed on the longbox, but when longboxes were replaced by security tags, the inserts disappeared once again. There's no understating the effect that the Sgt. Pepper album cover had on rock album artwork. More so than the offbeat stretched-image photo on Rubber Soul or Klaus Voormann's black-and-white collage/illustration on Revolver, Sgt. Pepper encouraged other rock artistes to come up with bold, colorful covers in response. Imagine how the covers of Family's Music In a Doll's House, the Rolling Stones' Let It Bleed, Marvin Gaye's What's Going On, any Yes album or even Rush's Moving Pictures - among many, many more - could have been possible without Sgt. Pepper coming first. There were also numerous parodies, the earliest example being the interior art work for Frank Zappa and the Mothers of Invention's We're Only In It For the Money (originally intended for the front cover but relegated to the inside of the sleeve by Zappa's label, Verve Records, out of fears of recrimination from EMI). One thing was for sure; after Sgt. Pepper, no one ever again put out an album cover that resembled a cereal box. Peter Blake never got rich from creating this cover, because Robert Fraser signed the copyright away. "But it has never mattered to me," he said in 1987, "because it was such a wonderful thing to have done." And rock music would be all the better for it. Click here for a full list of the personalities on the Sgt. Pepper cover. No Jack Lemmon, though.